Preheat oven to 400 degrees. Whisk vinegar, lemon juice, 1 tablespoon oil, and 1 tablespoon herbs in a small bowl; set vinaigrette aside. Lightly coat a large rimmed baking sheet with cooking spray. 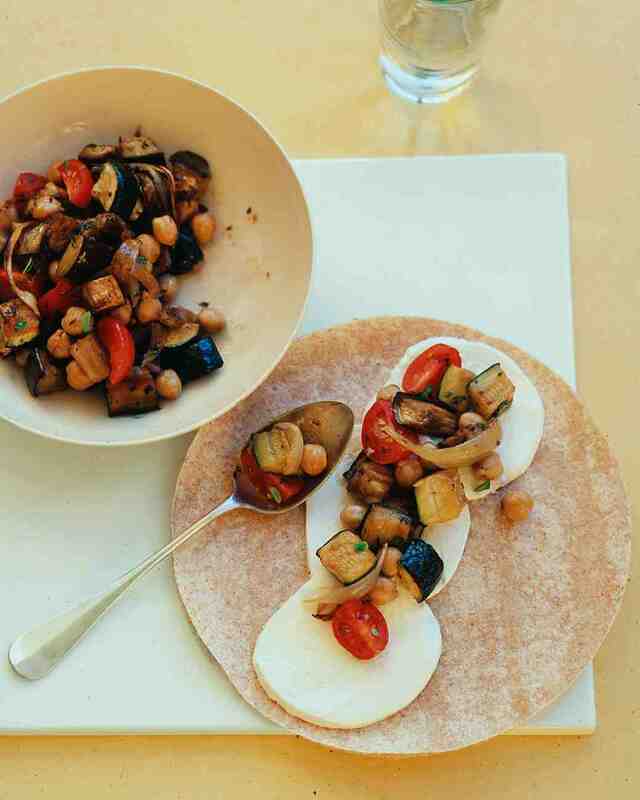 Toss eggplant, zucchini, onion, and remaining tablespoon herbs in a large bowl. Spread in a single layer on prepared baking sheet. Drizzle with remaining 2 tablespoons oil. Roast, tossing occasionally, until golden, 30 to 35 minutes. Let cool slightly. Transfer vegetable mixture to a large bowl. Add chickpeas, tomatoes, and salt; season with pepper. Drizzle with vinaigrette; toss to coat. Arrange mozzarella in center of lavash pieces or wraps. Top each with 1 1/4 cups vegetable salad. Roll up, and cut in half.